(1) Pulse in a food processor the flour, butter and salt until the mixture resembles a coarse meal with some small butter lumps. (2) Drizzle some ice water evenly over the mixture. Pulse until incorporated. Squeeze a small handful of the dough. If it doesn't hold together, add more ice water, a little at a time and pulsing till combined. Do not overwork the dough or the crust will be tough. (3) Turn the dough out onto a work surface and gather all the dough together. Flatten the dough and wrap it in plastic wrap. Chill till firm for at least 1 hour. (4) Preheat oven to 180°C. (5) Roll out the dough to ~0.3cm thickness and using a round cutter, cut out rounds and place the dough into muffin pans. (6) Prick the bottom of the tart shells with a fork and bake till tart turns golden brown. (7) Remove from the oven and let it cool. (1) Heat 1 tbs olive oil in a frying pan. (2) Cook the onions and garlic till soft and lightly browned. (3) Add in the beef, stirring until it changes colour. (4) Add in the tomatoes, water and sauce. (5) Bring it to the boil. (6) Reduce the heat and allow it to simmer until all the liquid has evaporated. (7) Stir in the peas and check the seasoning. (1) Boil the potatoes until soft. Remove and drain. (2) Mash the potatoes in a large bowl. (3) Stir in the butter, milk, yolk, salt and pepper till well combined. (1) Put the pastry casing on a baking sheet. (2) Fill it with the beef mixture and top it off with the mashed potatoes. (3) Place them in the oven until the mashed potato top turns slightly brown. (+) The pastry recipe is extremely crispy and is highly recommended for use in other pie recipes, be it sweet or savoury. 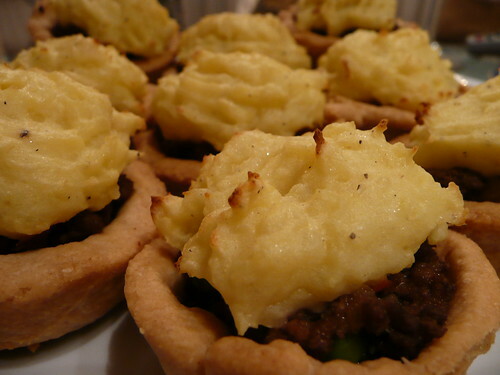 (=) Although small in size, these mini pies are quite filling and definitely delicious!